Long time followers of this blog know that I am obsessed with three things: Losing five pounds; reclaiming my throne as the rightful King of Norway; and perfecting Time Travel. While these first two goals continue to elude me, I am proud to announce that I have successfully built the world's first Time Machine, capable of sending a man into the past or into the far future. At a dinner party at my home last week, I unveiled a scale model of this remarkable invention. Several of my guests were understandably skeptical of my machine, but mainly they were concerned the oysters they had for dinner had not been refrigerated properly. 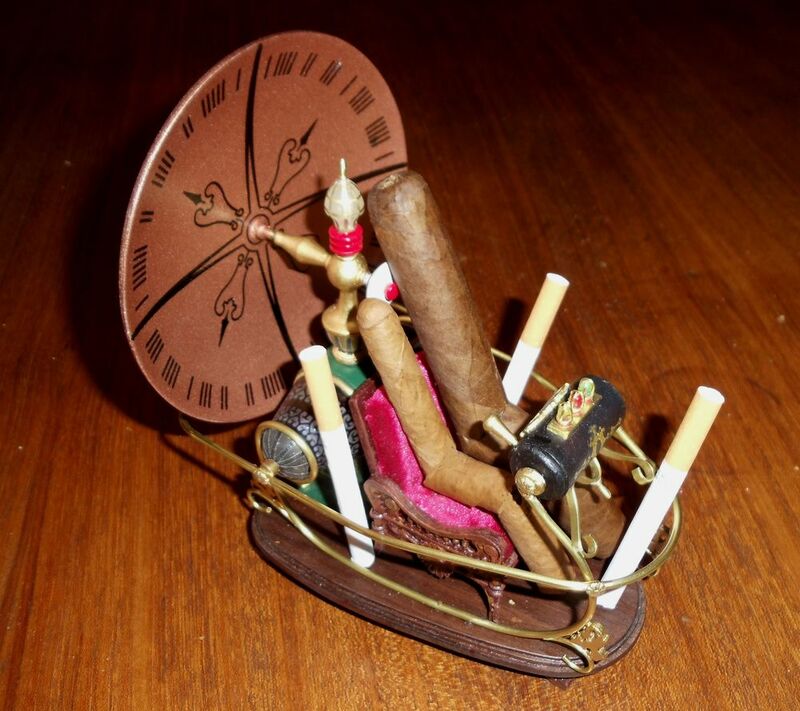 To demonstrate my Time Machine, I placed a cigar inside the model to simulate a human passenger. I then pushed the tiny lever of the machine forward, and to the amazement of all assembled, the model shimmered out of sight as it hurtled headlong into the distant future. Moments later, my Time Machine returned -- carrying with it a surprise from the future. For there inside the machine was not only my original cigar, but also his cigar wife and three beautiful cigarette children. Here was proof positive that my Time Machine worked, and that the world of the future is ruled by Tobacco People. As my delighted guests broke into applause, the enormous implications of my invention began to overwhelm me. Here was a machine that could be used for incredible good or world-wrecking evil. And I alone held the power to change the course of the Universe. At that moment my destiny became clear. I shall build a fleet of Time Machines -- armed with rockets and flamethrowers -- and plunder the land of the Tobacco People like an atom age Pizarro. Then I will capture these godless cigar creatures and sell them to tobacco stores throughout the world. With the pesky Tobacco People out of the way, I will claim their fertile lands for the Vast Stenstrum Empire, where I will build casinos and vacation homes for the super-wealthy. "With great power comes great opportunity."